Check out DirecTV! OK, maybe you can't because you have cable. However, they are certainly making a good argument for switching over. After all, they are starting to stack up some original programming -- and it's not lame! The satellite provider just announced plans to acquire the acclaimed drama Damages. 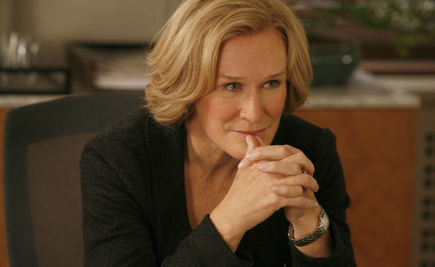 After three seasons on FX, the cable net had Glenn Close's show on its chopping block. Instead, DirecTV came in to swoop it up. Thanks fellas! Of course, Close will return, as well as Rose Byrne. Other major characters are also expected to come back, although no official announcements have been made. DirecTV also gets the rights to all of the show's previous seasons. It's unclear when those will air, but we're guessing you'll have a chance to catch up before DirecTV starts producing new episodes of Damages early next year.  Are You Watching Deadliest Catch?  2010 Emmy Nominations: Are You Happy?